Today sees the official launch of FixMyStreet’s open source codebase as a proper tool that we hope people will want to deploy in cities and countries around the world. 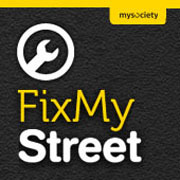 It is based on FixMyStreet.com which we believe is the most usable, most mature street problem reporting tool in the world, but which is only available to British users. We’re shouting about this launch a bit because we need your help to make the service ever better. First, we need feedback from programmers about whether we’ve got the install process right – whether it’s as easy and clear as we want it to be. And for non-coders who want to get involved, we want to ask for help with the process of translating the site’s text into different languages. Over the years there have been many copies of FixMyStreet set up in many countries, often using the site’s original name, but always written by developers from scratch. We’re delighted to have inspired people, but all too often the people trying to build copies have stumbled as they realise just how hard it is to build a tool like this with the polish that users expect. We think that people everywhere would be better off if they could have a local FixMyStreet that was really usable, and really connected to the right people. Building a global version of our MapIt political boundaries web service, so you can get going without having to wrestle administrative data out of your government before you get started. Plus with the help of the wonderful OpenStreetMap, you can get maps without licensing hassles too. Calling it version 1.0 is our way of saying two things. First, that the tool still has a lot of evolution left to do, and a long way to go before it is as good as we want it to become. But more ambitiously, calling it 1.0 is also our way of saying that it’s no longer just a codebase dumped into Github. It’s a real open source project, which we plan to support, and which we hope will make a real difference in the lives of ordinary people. Check it out.